I always thought this was one of Charlie Chaplin's nicest, most under-appreciated silent movie gems. Then I discovered it really wasn't underrated; it's rated very high on most critics' lists. It may be that I usually hear about some of his other movies than I do this one. Part of the reason I think so highly of this is simply that I'm a sentimentalist and story in this film is a very touching one. It's a romance between Charlie's tramp character (no name) and a blind girl, who also had no name in this film. Virginia Cherill, who played the blind woman and had a wholesome, pretty face which I found very attractive. I'm not always a huge fan of pantomime except for some great comedians of the era like Chaplin, Harold Lloyd and Buster Keaton, but Chaplin was so good at it and this is one of the last of dying breed as "talkies" were out in full force by 1931. Chaplin was at his best in silent movies, anyway, and his comedy routines are legendary. He gave me a lot of laughs in this film, as always, and I particularly laughed (I love slapstick) at the boxing scene. Kudos, too, to Harry Myers as the "eccentric millionaire." 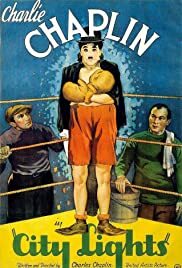 There's a lot of drama as well as humor in this 86-minute gem as the Tramp tries to aid a blind girl, raising money so she can get an operation to restore her sight. Comedy, romance, drama (with suffering) all combine to make this an extraordinary piece of entertainment. It's hard to believe this movie was not up for one, single Academy Award.